Info on the Cuyahoga River from Wikipedia: “The Cuyahoga River is famous for being “the river that caught fire,” helping to spur the environmental movement in the late 1960s. The name “Cuyahoga” is believed to mean “crooked river” from the Mohawk Indian name “Cayagaga,” although the Senecas called it “Cuyohaga,” or “place of the jawbone.” At least 13 fires have been reported on the Cuyahoga River, the first occurring in 1868. The largest river fire in 1952 caused over $1 million in damage to boats, a bridge, and a riverfront office building. On June 22, 1969, a river fire captured the attention of Time magazine, which described the Cuyahoga as the river that “oozes rather than flows”. The 1969 Cuyahoga River fire helped spur an avalanche of water pollution control activities, resulting in the Clean Water Act, Great Lakes Water Quality Agreement, and the creation of the federal Environmental Protection Agency and the Ohio Environmental Protection Agency (OEPA). As a result, large point sources of pollution on the Cuyahoga have received significant attention from the OEPA in recent decades. These events are referred to in Randy Newman’s 1972 song “Burn On,” R.E.M.’s 1986 song “Cuyahoga,” and Adam Again’s 1992 song “River on Fire.” Great Lakes Brewing Company of Cleveland named its Burning River Pale Ale after the event. 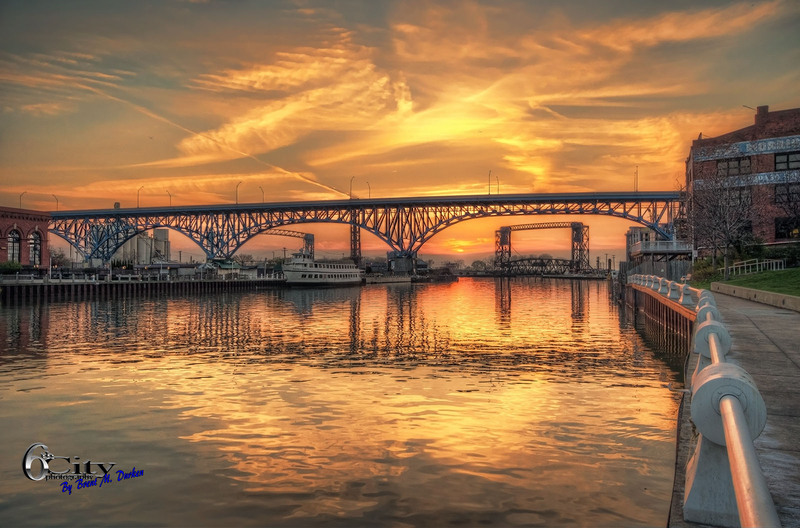 Water quality has greatly improved and, partially in recognition of this improvement, the Cuyahoga was designated one of 14 American Heritage Rivers in 1998″.